So, Friday was your last day in your previous position, and now it’s the first week in your new role as a leader (actual title may be supervisor, manager, lead). Nothing is more exciting than getting a promotion, and yet as daunting at the same time. Leaving the comfort of being a team member has many benefits: salary increases, perks, possibly more office space, etc., and with it so many new expectations, responsibilities, unknowns and moving parts. You have worked hard and been dedicated to developing your own skills, and all of those efforts have landed you this great opportunity. You may feel a heightened sense of pride and for a while it feels good to be you! 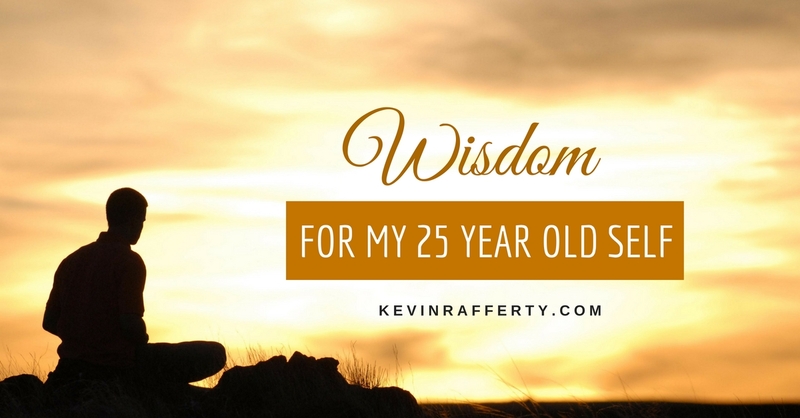 So, a question – What amount of wisdom, insight and talent was dumped into you over the weekend that has now prepared you for this new bigger role in which you find yourself? Yes, you still maintain all the job and industry knowledge you possessed prior, but now all eyes are looking at you, people are awaiting your input and direction, and wondering how you are going to show up. They are also concerned about what will change, how your promotion affects them in their role, and may even be worried about their jobs. Some may not agree with the decision to make you the boss, or at least may be cynical in their assessment of what they already know about you and the new expectations you will be facing. This wonderful change now comes with lots of new questions. Everyone before you who has risen in the ranks to be a boss, supervisor, manager, director, or C-level leader has had to undergo the agonies and ecstasies of promotion, just like you are now. You will also find plenty of people who will offer their advice to you in what to do, not do, and how to behave. You may even be put right away into some type of leadership training if your organization wants to help you get a better start in your new role. No matter, you still have to show up and begin to perform in new and unfamiliar ways. 1. Know Yourself. You are now going to be responsible for many new things and people, so you need to have a healthy level of self-awareness and knowledge about how you interact with others, how you take in information, and how you assess situations. I suggest you interview a few people in your network (co-workers, supervisors, family and friends) and ask them what strengths they most admire about you, what weaknesses they see in you, and what they might like to see you do differently to enhance the way you work and communicate with others. Take that input as gold, find ways to stay mindful of your impact on others, and get coaching or mentoring help in those areas proving more challenging. Self-awareness is the cornerstone to leadership, so begin to be intentional on how you can develop and expand in this area. 2. Know Your People. You are no longer the doer – a leader’s prime role is to get the right things done well through other people, so you need to become an ongoing expert in human behavior ASAP. I suggest spending lots of time early in your new role getting to know your teammates better, find out what they love about their job and where they are having difficulty. Explore what they know, and don’t know, and see where you will be able to offer assistance to them. Get a sense of the ‘feel’ of your team and organization, as this will help you navigate any areas that need improving or changing. I suggest, unless you are inheriting a sinking ship, spend 10-times more effort watching, listening and asking questions to what’s going on that speaking yourself in the beginning. Remember this – a leader is one who works with people and get’s them to want to give their best. You will be respected and beloved by how much you care for them and let them know you are there for them. 3. Know Your Mission / Deliverables. What you want is less important than what it is you and your team are put there by others to accomplish. When we agree to be hired, that agreement comes with expectations and requirements from those who hired us, so find out quickly what those definitions of success looks like in their eyes. When you are clear you can easily share that with your team and help them understand what success looks like. Have your goals and plans clear and visible, refer to them and their progress often, and let them be the guide for everyone to boost responsibility and accountability. Being a leader isn’t all about you – it’s about accomplishing your mission, together. 4. Know What to Track. The world of work has way too much information streaming at us, via reports, meetings, emails, and communications. After you realize your and your team’s deliverables, meet with your people and see what key measurables are available to all of you that best tracks whether you are progressing as planned. Leaders are concerned about meeting deadlines and due-dates, maintaining quality, meeting customer satisfaction levels, managing costs and motivating people, so look for metrics that act like gauges on your dashboard you all can refer to regularly. 5. Know How to Learn Daily. It’s not your job to know everything, in fact it’s impossible, so get comfortable with not-knowing, and yet keep an open and curious mind so you can see clearly what is really going on around you. Observe others, see the impact of decisions, look at how opportunities come in and out, listen to what’s being said, and not said, and pay attention to what’s working and not working. You job is to inspire others to put their best forward and get things done well. Your learning can then be shared with your team and your entire level of performance will rise. As you learn to coach better from the sidelines, you will learn more about people and find new ways to help them succeed. 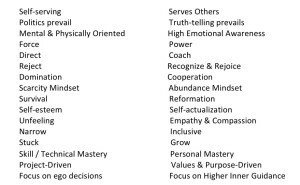 In my experience these are the core foundational strengths of successful leaders, past and present, and if you take these on as your own they will not fail you, nor the people you impact. Leadership is a never-ending, life-long journey for those who the rest of us affectionately and realistically call ‘leaders.’ Hopefully you are aspiring to be so well connected to the stakeholders you touch that everyone feels they are positively directly impacting the organization, and receiving the highest and best benefits of their being involved. Your kudos will come when everyone feels like they are winning, being heard and cared for, and have their own sense of personal and professional growth. 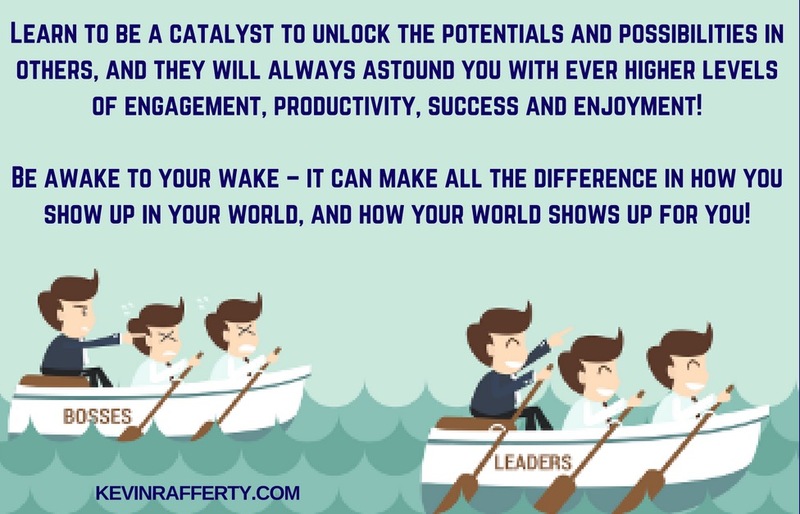 Learn to be a catalyst to unlock the potentials and possibilities in others, and they will always astound you with ever higher levels of engagement, productivity, success and enjoyment! Leadership is the hot topic in business journals, boardrooms and in the minds of most CEO’s. In my experience, most everyone calls people who are in positions of power and authority “leaders”, when in fact, they are mostly managers. 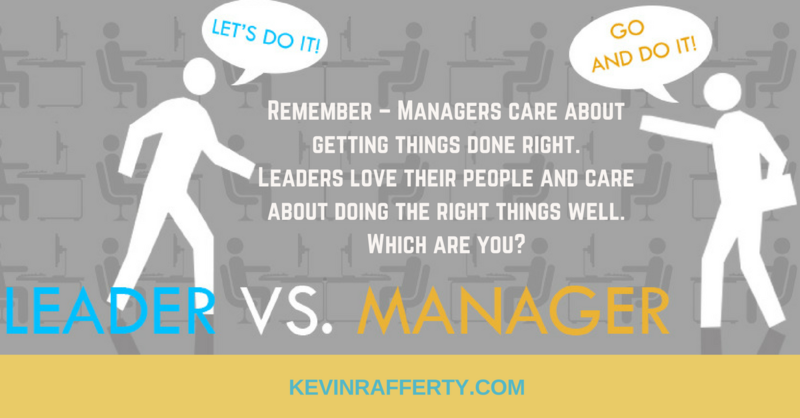 I love the old saying, “managers do things right, leaders do the right things.” I can update this by saying, “managers force things to get done, leaders inspire others to want to get the right things done better.” No matter the title, people who are responsible for others typically fall into two categories: managers or leaders. Look back in your work experience at those bosses you have worked with, and reflect on whether you tolerated, avoided, loathed, disliked, or disrespected them because of how you and others were treated by them, or, did you like them, felt trusted and listened to, and wanted to go the extra mile because of the environment they created? Managers push people, tell, want things their way, use intimidation and threats, while leaders openly communicate, influence others and keep focusing on the bigger purpose and values of the organization. Managers are more interested on results rather than connecting with the people who are responsible for getting the results accomplished. Too many managers are focused on looking good to enhance their own career and standing, where leaders look to make their teammates shine and works to help them grow their careers. When people ask me what’s the core difference between managers and leaders, I say managers are focused on externals, and leaders love people. Managers care about things and results, leaders care about people who get things done. Managers are more interested in wanting things their way, leaders enjoy the human interactions and want to see others succeed. Take a look at these characteristics and drivers I’ve listed below. Assess yourself first, then center on current and past managers / leaders. What areas you can further develop? Who can you ask to give you feedback and do some evaluations so you can see yourself more clearly? As you reflect also see which ones you’d like to expand into and improve. Get some feedback from co-workers and supervisors and use that to develop your own personal improvement plan. Get coaching and have peers help keep you awake and accountable to meet your improvement goals. Leaders who love people get more productivity and higher quality work than managers. Leaders make more money for their organizations and people than managers. Leaders create more engagement, enjoyment and harmony than do managers. Leaders make work fulfilling and meaningful and lift people up. I bet the bosses you love were more leaders than managers. What kind of person are you . . . one who enjoys working with others, one who cares what others are going through, and one who relates? If you want to be a leader, look deep and long into your own “people-skills.” The good news is that people-skills can all be learned and developed throughout one’s lifetime. The world needs more leaders, what about you? Remember – Managers care about getting things done right. Leaders love their people and care about doing the right things well. Which are you? If you’ve ever ridden in a boat, and looked out the back, you always see a wake from the propulsion system creating waves and turbulence in the water. Depending on the speed and angle of the turns of the boat, the wake has varying degrees of significance. 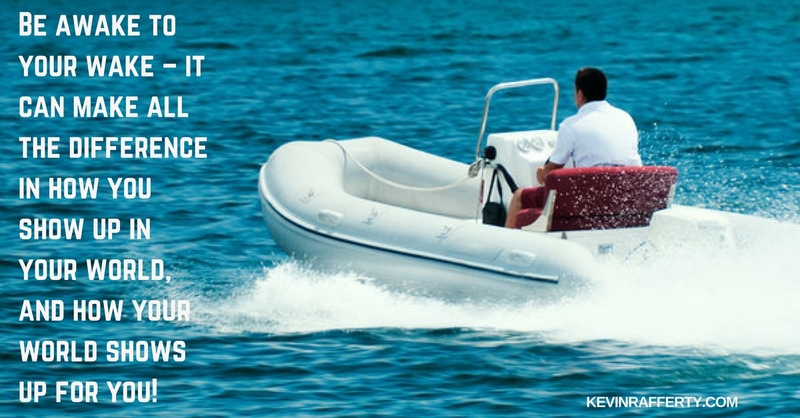 Those in the water close after the boat passes definitely know what impact the wake has on them as they go bobbing around, and when higher speeds or sharp turns are involved it can pose quite a concern. We humans are like boats in the water. We go about our days passing people in a variety of ways. Yes we encounter others in the physical sense, in close quarters at home, work, or social places, and we also connect via all the electronic media we use to get in touch. Yet we almost never really slow down enough to think about how we are showing up with others, and what our interactions cause to stir up within those we engage. Every action has a reaction, and every word has an interpretation. Every piece of body language sends multiple messages out into the ether. The question is, are you aware of the impact of your wake? With my coaching clients I love to use the word ‘wake’ because we all know what it means, and it is the root of another word – ‘awake.’ To wake is to become roused from some previous space of sleep, tranquility, or inactivity. To awaken is to become aware of where you are, to see clearly what is really going on around you, and to stay awake to what’s happening. To awaken is to have a ‘boat’ pass close enough by you to shake a wake of turbulence into your mental state. Are you awake enough to know what impact you have on others? Do you know what impact you have on those around you? Are you aware of the affects you have, in body, words and deeds on all the others you encounter during the days of your life? – Tell me one or two things about the way I show up with you, and communicate with you, that you truly appreciate? – Tell me one or two things about the way I show up with you, and communicate with you, that you really don’t’ like, or struggle with? – Tell me what you’d like to see different from me (start doing or stop doing) that would make a positive impact on our relationship? By being mindful of how we make a difference to those around us can shift relationships quickly, can lead to improved productivity and reduce errors or misunderstandings. Being mindful of your wake significantly reduces incorrect assumptions others may carry which can make relationships messy and unstable. Being awakened to your wake will make a huge difference in yours and those around you. Be awake to your wake – it can make all the difference in how you show up in your world, and how your world shows up for you! I often look at what others are saying about the important topics of the day. This past month’s focus has been on consciousness, or living “above-the-line.” Read the wisdom shared below, and self-reflect on where your awareness/consciousness is right now! My last two blogs addressed the two states of living/being I refer to as “above or below” the line. There are only two states we humans can live within: either we are fully aware and awake in this present moment, or we are not. In essence it is like flipping a light switch on or off. We live either in the light, or in the dark, and actually it takes an inordinate amount of focus, attention and skill to live in the light. The ‘line’ in this case is the demarcation zone between being in the light or not. When looking at what these two actually mean, think of it this way. When we are present, aware and awake to what is currently going on within our mind, body and spirit, the part of us that observes, that is aware and knows it’s aware and is experiencing what is going on right now, is active. That observer becomes aware of the thinking and feeling that is going on right here, right now. The thinking and feeling states of one who is conscious in any given moment center around the root states of love, joy, peace, freedom, caring, connection and power. 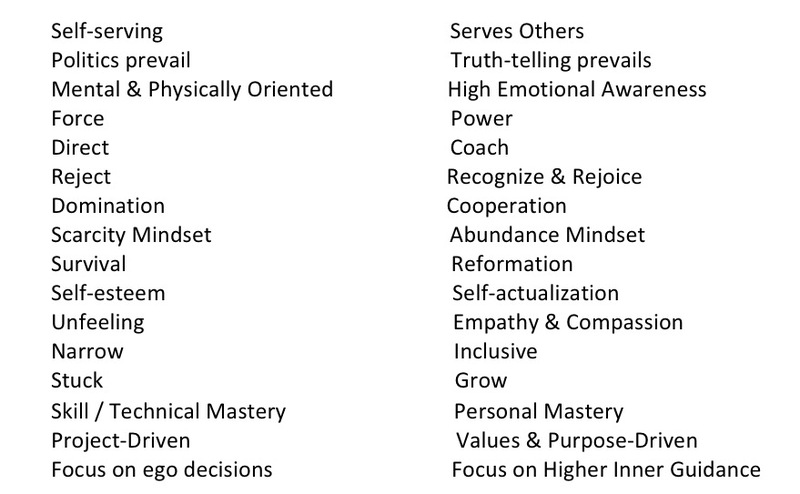 When you can assess and then know you are sensing any of these, you are conscious. Another way to be conscious is if you are in a negative state, such as fear, shame, sadness, loneliness and such, and as you pause to self-assess: you can sense that right now, in this moment, you are feeling one of these, and you choose to stay fully awake and aware while in that state and allow it to be fully experienced and then pass, you are conscious. In other words, being conscious can just happen, and you are conscious that you are conscious in that moment or stream of moments, and just be with it, or you can choose to be conscious, no matter what is going on within and outside of you. When you recognize that you are conscious or choose to be conscious – the light is on. All other times the light is off. What happens when the light is off? We automatically revert back to what I call our ‘default conditioned self.’ This is the you that since birth has developed primarily from what outside sources have instilled within your psyche. Our parents, family, teachers, friends, society, culture, and institutions all try to help guide and form our lives, and they do so by telling us what we should do and not do, think and not think, and be or not be. We become a conglomerate of beliefs from a bunch of other people, who, by the way, were all raised the same way we were. We also are a product of earlier childhood experiences and interpretations that may not be serving us best in our current state of adulthood. The person we are now operates so much without active conscious thinking. Our behaviors and results are driven by subconscious habits and beliefs. This type of consciousness happens ‘in the dark’ and is our default auto-pilot way of getting along in daily living. It’s impossible to be fully conscious when we are living with mindsets and emotional states such as fear, reaction, judgement, drama, stories, blame, shame, trying to look good, covering up, and putting up walls and blocks to protect ourselves from others. Most people are so conditioned from their past that they think they are conscious, in fact will boast about it, yet they just keep getting pulled into the same patterns of thoughts, feeling and actions. Conscious people self-assess and make corrections when behaviors go dark – unconscious people just keep going along their past patterns, often making lots of noise and with plenty of drama, but they are still stuck. – Find a way to self-reflect, and often. Start reading books, attending programs where you expand your mind to new areas of thought, and you do the thinking, rather than get hijacked by the thinking of your belief system. Really be open to others perspectives and experiences, and then be open to the intuition within you to assess and make changes to your own ways of thinking and being. – Have a process to assess your belief system, see which ones truly serve you now, and which prevent you from living more freely, lovingly or healthily. Be able to let go of the beliefs that need to go. – Find ways to give yourself quiet time to just sit and be with you, your thoughts and feelings. Meditation, mindfulness and contemplative practices are very helpful and powerful to give one a deeper sense of self beyond the superficial. – Find tools to help you ‘remember-to-remember’ if you are conscious or not. Some type of visual cue (a bracelet, desktop figure, reminder on a mirror, etc.) or calendar things that help you become aware of where you are, where your thoughts and emotions are, in any given moment. – Look deeply at who you really are now – what are your current values, what are you most passionate about, what are your highest and most valued skills, what vision and dream do you have for you now, and see if there is a sense of bigger, deeper purpose to your life. Discovering who you are now allows you to move past who you have been. – Higher self-assessment and self-regulation skills. – More awareness of the sensations and energetics of their bodies. – Higher degrees of compassion and empathy for others. – Greater communication, conflict-resolution and problem-solving skills. – Think from a broader scope and are skilled at integrating various constituencies. – Higher levels of integrity, where they keep their word and take responsibility when they break it. If we continue to live and work primarily ‘below the line’ we will continue to do and create what we are currently experiencing. We will not solve any of the big problems we are facing, nor will we really invent any new ways to live better. What we see now is what we will continue to get, yet with more people on the planet each day the current status quo can only lead to more stagnation, gridlock, disconnection and disenfranchisement. If we can learn to live more consciously we can create new outcomes. We can resolve past issues and co-create new possibilities. We can work together in harmony and relieve ourselves of suffering, hardship and separation. We will also get far less negatively triggered, and when we do we can positively recover quicker and clean up any relationship messes we made. We can consciously evolve ourselves, our relationships, our organizations and our cultures. Consciousness is a choice. One set of choices results in doing the same things over and over again, expecting different results (the old definition of insanity), and staying stuck. The other choice is to wake up, get real, see what’s true, and choose anew. Being conscious is most needed now, yet it’s the most difficult thing to do. Are you ready and willing to play a bigger game, the most important game – or will you pull back, play small, hide, or blame others for your plight? It’s your choice – choose wisely! Impulsive, powerful, egocentric and heroic characterizes the mindset in this worldview. Powerful beings dominate the scene and everyone is under the control of one powerful leader or group. In this world, the powerful ones give the orders, the underlings obey. This trait or consciousness can be seen in tribal cultures, gang leaders, rock stars, people in the frontiers, or rebellious youth. The world is under the dominance of one order, one religion or an all-powerful bureaucracy. Those who follow the righteous order are accepted, while those who object to it are subject to ostracism and punishment. Everyone has to follow the code to live in harmony with the society and reap the benefits. There is only one right way to think, and law and order is dictated by that right way/order. May often be predominantly fundamentalist, conventionalist and conformist way of life. This trait or level can be found in religious groups, puritan America, totalitarian societies, and groups that stick to moral codes. This is the terrain of the over-achieving, scientific and strategic individuals. Dominated by self-interest and will, it marks the growth of the society through scientific and industrial revolution. Instead of succumbing to the herd mentality, people are individualistic, rational and achievement-oriented. Materialism dominates here and the world is a place where success and science rules over everything. This trait can be seen in Wall Street, in the upwardly-mobile middle classes of the world, in modern capitalist industry, and in emerging Asian cultures. Predominant traits are collaborative communication, networking, human bonding and ecological sensitivity. Set against hierarchy and social institutions, this level strives for bonding and equality among groups. There is belief in and acceptance of pluralism, diversity, and multiculturalism. Communities or groups are valued over individualism. This can be found in movements like civil rights, women’s rights, human rights, animal rights, and diversity. One key commonality about people who operate predominantly through these world views is that they see their view as the right, best, correct way . . . thereby making all others wrong, bad, or incorrect. Just take a look at this political season in the U.S., and you can see how these four are playing out right in front of us. We also can combine the aspect that we all, as we were raised from birth on, have been heavily conditioned by one or two of these world views without even consciously knowing or choosing to adopt them for ourselves. Coupled with making interpretations of what is safe and dangerous, right and wrong, or in looking good and avoiding looking bad as we developed, we come of age with so little self-awareness and conscious present-moment thinking capabilities. We go about following the ‘shoulds,’ ‘have-to’s,’ ‘don’ts,’ of those who have come before us in order to fit in, make a living, and try to find some level of success and happiness. So much of our daily activities are conducted without a lot, or any, conscious thinking. We seem to always be in some sort of ‘survival’ or ‘protection’ mode, and fear in its many forms drives our emotions-thoughts-actions-results. How do some move beyond this hamster wheel of repetitive, self-centric, reactive ways of being and living? They self-reflect and educate themselves on other ways of thinking, knowing and doing. Whether driven by a deep frustration, depression or some type of wake-up call (such as a significant loss of a loved one or job, or by divorce or disease), some wake up to see new levels of reality and are motivated to grow beyond the levels they inhabit. As they expand their levels of awareness, they see more easily how others think, gain more compassion and empathy for others, and further their own development of the emotional-relational intelligences so they can be more of a positive impact and presence in the world. It all boils down to consciousness – and whether you are living more from the unconscious /sub-conscious programming of your past, or have developed new abilities to live more consciously “in the moment.” In each of the four world views outlined above, most lives are lived in the unconscious mode, where we find ourselves following the values, norms, fears and beliefs of those mindsets without consciously thinking or evaluating for ourselves in the stream of the present moments of our lives. While we think we are awake, and we say we want different outcomes, we are stuck in the thinking that created our current realities, and so our lives remain the same. That’s the basic definition of living more from the unconsciousness than conscious. As we live unconsciously, we are reactive, feel as if we are victims of life, fault and blame others for our pains and discomforts, have a loss of power, see life as a limited pie from which we have to get our piece, feel separate and alone, and are very self-centered /ego-centric. When we live consciously we are more intentional of our thoughts-feelings-actions, see ourselves as the creators of our lives, take responsibility for our actions, have a strong sense of confidence and power, sense there is plenty for everyone, and experience ‘in-the-flow’ moments and feel more connected. Choices and decisions made with higher consciousness mostly result in better outcomes with less stress. 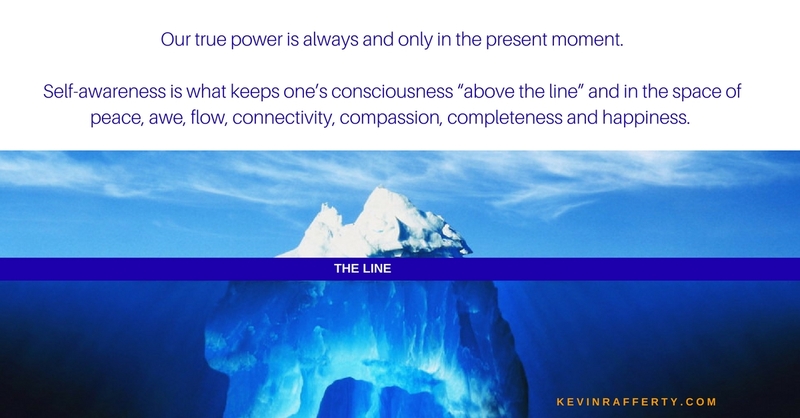 To simplify our understanding of being more aware, more conscious, I use the concept of “below and above the line.” When we are coming from an unconscious mindset we are operating below the line of conscious awareness, and when we are more conscious we are above the line. It’s an easy way for me to check in with myself regularly during the day to see if I am fully here now in the present moment, or am I in some type of victim-ego-controlling-judgmental-reactive frame of mind. 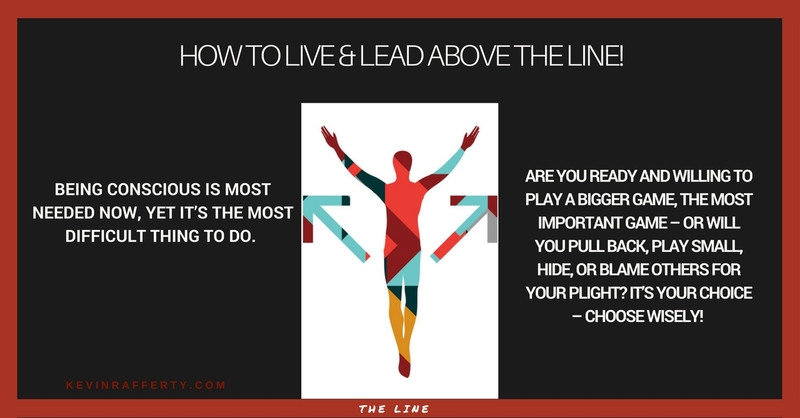 Bringing my attention to the question, “where am I now, above or below the line?,” allows me to immediately self-assess and self-correct if necessary. When I am above the line I communicate better, I connect more authentically with others, I can easily see the root of a problem and offer better solutions, I am more present with others and can be a better coach, and I find I am in the flow of richer feelings of joy, awe, gratitude and peace in my life. Try asking yourself numerous times a day, “Where am I now, above or below the line?” If you find you are below the line, just observe your mental/emotional state, identify the feeling, see what other feeling would be more desirable in that moment, choose it and just let the energy of the past disseminate from you. If you find you are above the line, find something to be recognized and then appreciate it fully. I know this will work to bring you more self-awareness, which is the core point of personal power we all can tap in to when desired. Our true power is always and only in the present moment. Self-awareness is what keeps one’s consciousness “above the line” and in the space of peace, awe, flow, connectivity, compassion, completeness and happiness. One thing that is clear to me about the youngest generation in the workplace is that they are poised to revolutionize the way we engage each other in the world of work. In conversations I have with many in that generation, they see through the flaws and pretenses the basic four active leadership styles exhibit. They see the way the autocrats shut people down in order to be in total control. They are frustrated with the bureaucrats need to run a tight ship and put everything and everyone in a box. While the achievers seem interesting at first, the way they feel used and taken for granted with little recognition leaves them feeling resentful and frustrated. The collaborators work better with the Millennials, yet they take far too long to make decisions and things happen, which leaves the Millennials confused and anxious. The older generations have been dealing with these four styles for so long we have been numbed down to just accepting that’s the best were going to have, and settle into ways of working that keeps us avoiding, pleasing, pretending, acquiescing, pandering, and hiding that makes us 75% disengaged in our work (Gallop). Disengaged workers generate far less profit, create too few new opportunities, aren’t interested in productivity enhancements and opt-out of problem-solving situations at a time when our economy and world need new, fresh ideas and energy in order to solve big problems and make our organizations run at optimum. Millennials are entering the workforce in numbers larger than the Boomers ever did, and are crashing into the leadership styles that prevent, diminish, or disincentivize them from bringing their best to their jobs. They come into the workforce better educated, more tech savvy, and with higher expectations than any other group prior – they bring fresh energy like no other. They want to be part of something interesting, something bigger than themselves. They want to collaborate, be heard, and participate in bringing in new initiatives. They still have the youthful creativity and adaptability that can drive innovation and change. Yes, like all new workers, they have flaws and areas needing maturation and development, yet no matter what your opinion and experience of them is, they indeed are the leaders of our tomorrows. For that very reason we must wake up and co-create a new form of leadership that they can embrace and be successful. I have worked with and coached leaders who have evolved themselves and model this next generation of leadership. I call this “Authentic Leadership,” and I know this will revolutionize our workplaces and our world, because it has demonstrated its efficacy in organizations in present time. 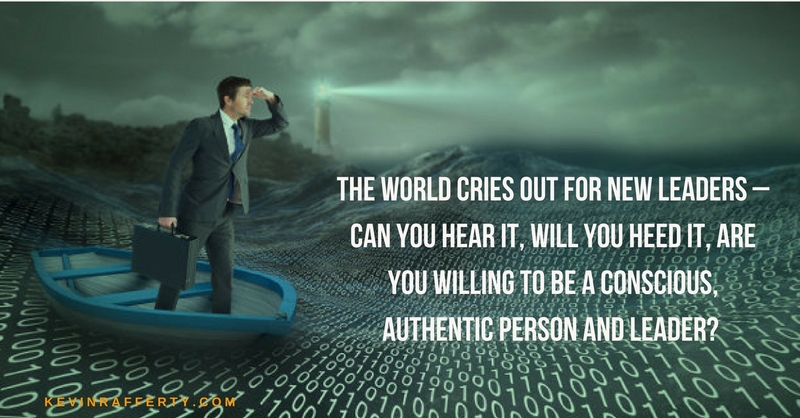 While anyone can potentially become an authentic leader, it’s not for everyone. This type of leadership goes beyond barking orders, intimidation, leading by fear and pushing people beyond the limits and expectations of reason. This type of leader isn’t stuck in the old beliefs that people are naturally lazy, need to be told what to do, or are just part of a bigger numbers game for someone else’s benefit. This type of leader is grown from the deep-rooted premise that people are inherently good, that they want to do good and great work, and be a part of a healthy, thriving, prosperous entity that honors, respects and cares for all the people aligned. Authentic leaders build ‘people-centric’ organizations, not because it feels good, but because it’s the right thing to do, and those kinds of organizations deliver far superior results than their competitors who are numbers and profit-centric (Firms of Endearment). Authentic leaders know what people need to thrive at work, and when people know they are perceived as the number-one priority, they are much more open to bring new ideas to the table, to work together better to quickly and sustainably resolve problems, are much more engaged and generate higher levels of performance and profitability. They are more self-aware, conscious human beings. They have taken the time to develop their ability to self-reflect and self-analyze from a non-ego perspective. They express openness, vulnerability and trust that welcomes others to bring their better selves to the table. They embody the facets of authenticity, which are: mindfulness, emotional intelligence, integrity, values-driven, bring their passions, know their strengths and weaknesses, self-responsible and accountable, and have the ability to self-monitor their emotions and willingly clean-up any messes they make. Through their own journey within themselves, they are much more aware and in-tune with all other people. They know how people tick, and have become more accepting of diversity and more open to things outside their ability to control. They have the ability of insight, see a bigger, brighter future, and can enroll, inspire and influence others in their initiatives to aspire and achieve things not previously thought possible. They see the intricacies of all the systems in play, not just the technological or mechanical, but the informational and human systems that comprise our everyday world. They take great joy in orchestrating and integrating all the energies that an organization requires, and have become adept at offering a loving hand that guides without manipulation. They come from a conscious leaders’ perspective and build organizations that are purpose-driven to realize something beyond financial gain. They attract like-minded people to build cultures and leadership systems that are more fully alive and better adapt to our fast-changing world. Authentic leaders care. They care about people, all stakeholders, and model the new form of ‘loving-leadership’ every day. They share, be it information, power, or profits. They know that by being more ‘servant-leader’ oriented, that people willingly follow and offer so much more of themselves to the benefit of all involved in the organization. They create teams, organizations and communities that generate well-being, happiness, fulfillment, and foster a deep sense of significance for all involved. It is not an easy path to becoming a more authentic person and leader. Yet, the alternatives are daunting. Life as it is / has been, OR life lived well with more awareness, connectivity, joy, peace, accomplishment, and love – those are the choices! 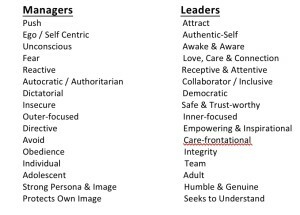 My sense is that the younger Millennial generation is wonderfully suited to choose authenticity as their leadership style, rather than the old ego-centric options. I can see them in countless ways driving the evolution of our teams, groups and organizations as they bring this fresh, human-affirming way of leading into our world. The impact of the Millennials not taking on authentic leadership consciousness is that more of the same will ensue; in fact, more of the same will continue the constriction and decline of the human spirit, and contribute to the growing, unresolved problems of our times. It always comes down to choice – my hope is more Millennials are waking up and getting real with themselves and others, which is the first step toward creating a new day. I see this new generation leading in ways not witnessed before, and that will make all the difference! 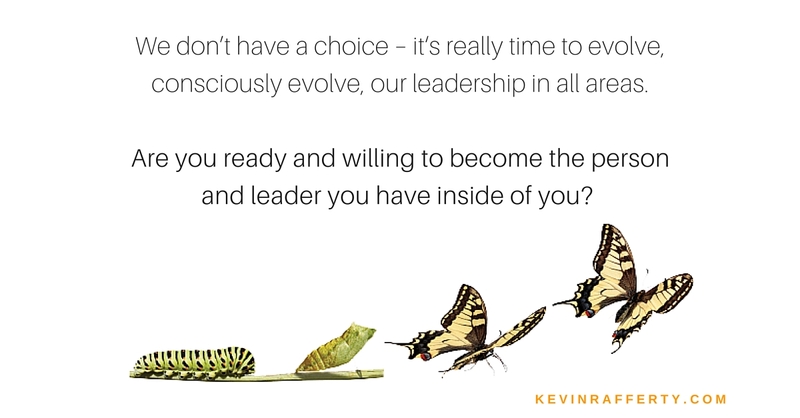 We don’t have a choice – it‘s really time to evolve, consciously evolve, our leadership in all areas. Are you ready and willing to become the person and leader you have inside of you? I have written previously that while each generation of Americans, from the war generation to Baby-Boomers, Gen-X and now Millennials, is formed by many different social, historical and technological factors – we as human beings all share similar drivers. The most success and happy people seem to intuitively know who they are, what motivates them, and how to take personal responsibility to create a life of their choosing. No matter your age or generation label, people everywhere want to live life more fully, joyfully and prosperously. They have high levels of self-awareness. The type of self-awareness I refer to is a level of being present/conscious to what is going on within, around, and by oneself in most of their waking moments. These people are much more aware of what and how they are thinking and feeling, and have a way to recover from emotional triggers and reduce the levels of negative impact that are a part of the human condition. They take responsibility for their actions, and are able to make peace with those in their space. Self-aware people are often referred to as having high emotional Intelligence, exhibiting being more skillful in areas such as: self-regard, assertiveness, independence, self-actualization, empathy, compassion, social responsibility, interpersonal relationships, stress management and tolerance, impulse control, adaptability, flexibility, problem-solving, optimism and happiness. The good news is that self-awareness and emotional intelligence can both be developed and expanded to maximize one’s ability to be a high functioning, emotionally balanced and effective person at work and in life. They live their core values. Those who have consciously established their core values are the ones that have a consistent mechanism to assess situations and make decisions that are congruent with their whole being. We all have values instilled in us since birth, yet few take time to self-reflect enough to see what values they now hold most dear in their adulthood. There are lots of values out there, and those at our core are the ones we default to, and people who are more effective and happy know their core values and use them when dealing with choices life decisions. 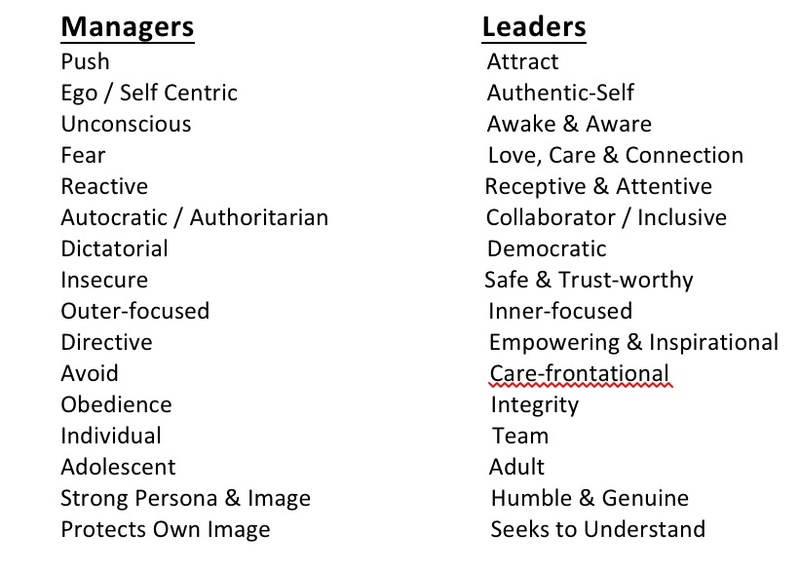 They align their passions and strengths with their organizations and roles. People who know what brings them alive, who are cognizant of their innate skills and strengths, and have found ways to bring these into their daily lives, especially in their work, are the most happy and fulfilled. They see every day as a way to both be fully on-fire and to be of higher utility and service to those around them. The old saying “follow your passion” works for these folks because they take time to find organizations and roles that they better fit in to, rather than just take the first job that pays the bills. When we are around those who have a strong sense of purpose, we admire them for their energy and sense of direction. These people see a bigger picture, one that touches, moves and inspires them to greater levels of commitment and action. Whether their purpose is aligned with the organization, or it has a higher calling aspect, purposeful people are the go-getters that make things happen, and they do it without ego, fear, or negative fallout. They care for other people. The more happy and successful people get more out of life because they like, love, and connect better with others. Unless you want to live in a cave, we all live and work with other human beings, and those who take time to learn and understand about human nature seem to just get along so much easier and more effectively. Being of service goes a long way not to just make others feel good but also to generate a stronger and healthier sense of self and self-worth. The highest form of leadership is to know that when we care about others first, we build trust and respect that is the foundation of all meaningful relationships, and results in outcomes that have more positive, meaningful and profitable results. Don’t wait any longer for your career to make you happy, or waiting for the big paying job to make you feel successful, or the right person to complete you – you will never get lasting satisfaction out of external motivators. Take time to self-reflect, find the authentic aspects within yourself – your values, your passions, your gifts, and your purpose. Look for ways to assess your abilities to get along in life and with others, and decide to self-improve and grow where you see yourself lacking. Realize that a huge part of living and living successfully is in how we get along with other people – all types of people, and choose to master the skills you need to better connect, understand and work together better with others. When you take charge of your destiny, your journey will be more joyful and the results will be more fulfilling! 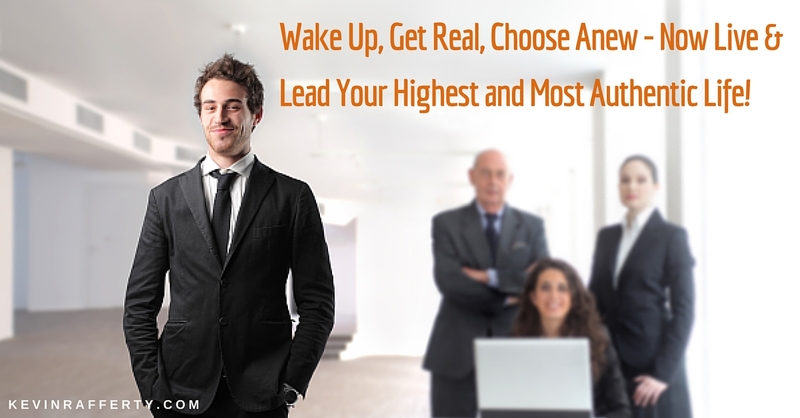 Wake Up, Get Real, Choose Anew – Now Live and Lead Your Highest and Most Authentic Life!